Entry Doors: What Are My Options? As the first thing visitors notice when coming to your home, the entry door is both a symbol of invitation and a bastion against intrusion, so choosing the right one is critical to the appearance of your home as well as its security and privacy. Entry doors, unlike their inside cousins, must be sturdy enough to withstand the elements and maintain their welcoming good looks. Generally, there are three choices in entry door materials, each with benefits and limits: wood, metal, and composite. Solid wood doors are among the most coveted for entries because of their timeless beauty and historic authenticity. Hardwoods such as maple, oak, and walnut are used to make some of the most elegant and unique doors imaginable. However, wood doors require a good deal of upkeep, are prone to warping and splitting, and are not especially good insulators. Hollow-core doors should never be used for exterior purposes. Metal doors, especially steel, may be a better choice in the long run as they boast high R-values, are highly fire resistant, and usually cost about half as much as solid wood. 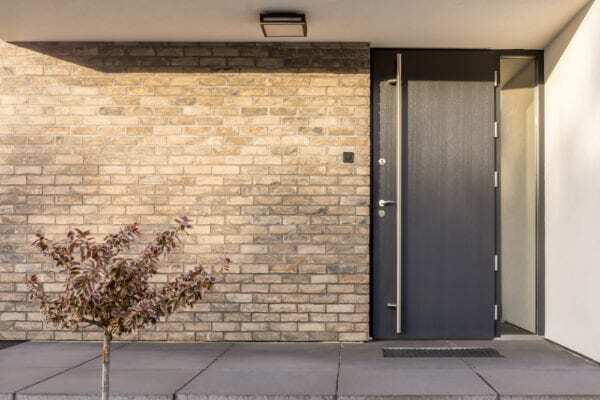 Aesthetically, metal doors don’t stack up to wood, but manufacturers have made great strides in the past few years to make them look less industrial. And their paintable surface makes matching siding simple. Steel doors may rust or corrode and, if not good quality, are prone to dents. Choose a door made from thick-gauge steel for beauty and longevity. Composite doors, either wood or fiberglass, are an appealing choice as they combine all the best properties of wood and metal. They have the rich, warm look and feel of wood and provide the insulation properties of steel without the maintenance requirements. Fiberglass composite doors usually include a polyurethane core making them among the best insulators. They are the perfect choice for extreme climates and weather, as temperature differentials do not affect them. They are a bit pricier than steel doors, however, and much heavier. Wood composite doors may be formed of fiberboard, particleboard, oriented strand board, plywood, or combinations of these. They also include foam cores for insulation. To help protect the surfaces of their doors, many manufacturers add vinyl cladding, which also adds a layer of insulation. Look for this feature on both steel and composite doors. To glamorize the entry door, manufacturers offer enhancements such as glass inserts, raised panels, transoms, and sidelights. In addition, it is now possible to find doors in a huge range of widths and heights to create an entryway that is truly spectacular. When checking out the various choices in entry doors, remember to stick with a reputable manufacturer that offers a solid warranty. Once your door is in place, follow the manufacturer’s recommendations for maintenance to keep your entry looking it’s very best.